We offer Victorian Lessons to Key Stage 1 classes. One of our actors will conduct the session, meeting the children first out of character, before transforming into the very strict “Miss Perkins”! The session involves roleplay, as your class will be expected to behave like good Ragged School children. The session will end with a de-brief, led by our actor, where there will be time for discussion and questions. This session is designed to be engaging and fun, rather than frightening, and we take care when working with younger visitors who may be of a sensitive disposition. Polly and her family lived in the East End over 100 years ago. Left alone on Monday morning, 6-year-old Polly is left to do all the family chores for the week. 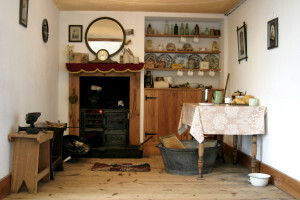 Based on family life and the days of the week, children will sing songs and rhymes and handle real historic artefacts. Give your students the chance to perform Polly’s Story live in our Victorian East End Kitchen! During the morning sessions, classes can take part in both Polly’s Story and the Victorian Lesson. During the afternoon, classes can take part in either session. Where available, we can take two classes for the morning sessions, and one class for the afternoon session. Our sessions take place on the 1st and 2nd floors of the museum. If your pupils have any mobility needs, please contact the museum as soon as possible to discuss how we may meet them. The cost is £157 per class; or £140 for Tower Hamlets schools. There is no Minimum class size; the Maximum class size is 34. 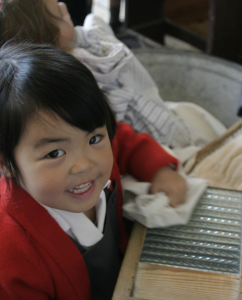 To book a school visit, please contact the museum by calling us on 020 8980 6405, or by emailing us at schools@raggedschoolmuseum.org.uk. Before you call or email, we recommend that you view our Frequently Asked Questions, which contains information about our new pricing structure, facilities, and booking procedures.